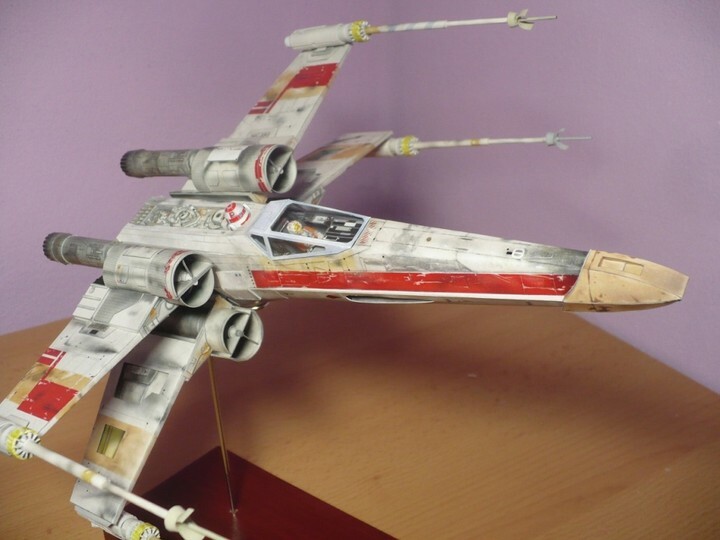 This webpage is dedicated to my paper model of the iconic X-wing fighter in 1/48 scale. The model is freely downloadable, so with some skill, you can build your own! Just follow the instructions and take a look at the assembly progress photos. The photos come mostly from the testing version, so some minor details and colors of some areas are missing or different from the final model. Also if you like the model, consider making a little donation: you will support me in creating new models and developing tools for paper modelers that way. Thank you! proportions are based on detailed examination of all the photos of original studio models I could get. Some measurements were even taken from same kits that were used on originals, all to create the most accurate paper version I'm aware of. the fuselage was modelled in Wings3D and unfolded in Blender with additional work on parts done in Inkscape, which was also used to create wings and engines. textures were drawn in Gimp using 300dpi resolution, so there's plenty of detail even if you decide to upscale the model. fully finished model will have over 600 individual parts. Looks like a big number, but that's mainly because you will need to build some sections 4-times. several texture versions available - combine parts from various releases to create your own unique X-wing!